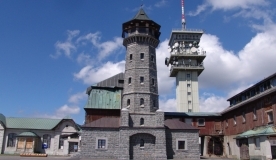 While wandering through the town, do not forget to visit also the Museum Horní Blatná. Museum Horní Blatná is located in the city centre in a brick building with a timber framed upper floor from the 18th century. Apart from the exhibition, you might be interested in the beautiful interior of the building with original stucco ceiling and coffer ceiling above the staircase. Exposition presents the history of mining and processing of tin ore in Horní Blatná and Boží Dar. There are examples of pewter dishes, local minerals and mining technical equipment. A favourite exhibit is a large model of the Horní Blatná. The tour lasts approximately 15 minutes and the guide provides commentary in Czech and German. The Museum Horní Blatná is a part of nature trail Horní Blatná – Vlčí jámy. The Museum Horní Blatná is opened for public from March till December from Wednesday till Sunday. If arranged in advanced via phone, you can visit the museum also outside the usual opening hours.